6 Best 4k Laptops In 2017 - Ultra HD & Crisp Resolution! 6 Best 4K Laptops In 2017 – Smooth & Crisp Resolution! Our only source of interaction with laptops is the visuals and display screen. That’s what defines the user experience mostly. If it is not looking good then it won’t inspire people as much as it should – that has been the basic phenomenon for centuries. The focus on visuals and the supreme display have led to many innovations in the respective field. The current standard of the highest quality display screen is 4K resolutions. TVs and cameras have already adopted 4K resolutions. Fortunately, computers also worked up to become 4K resolution compatible. For now, we will focus on the best 4K laptops available in the market. Before we move on to our topic here, let’s just quickly touch upon the basic definition of 4K resolution. The term 4K or 4K resolution defines a horizontal screen display resolution in the order of 4000 pixels. 4K resolution is known to be the best display out there currently. Most digital TVs are 4K resolution enabled. For laptops as well, 4K resolution is supposed to enable premium graphics and display. 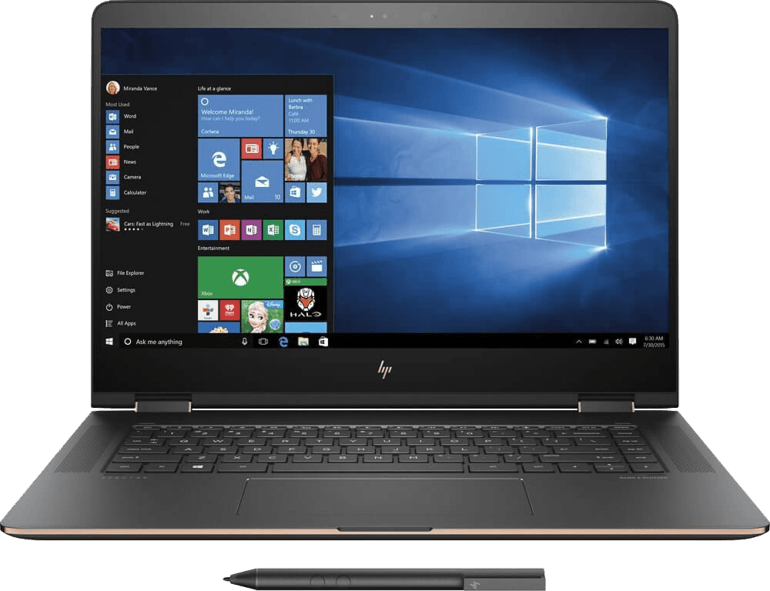 List Of Best 4k Laptops In 2017 – Ultra HD Resolution & Fine Detailing! HP Spectre x360 is a powerful new entry in the 4K laptops world. It is a fine looking laptop built with the best and latest technology. With the weight of 4.4 pounds, HP Spectre x360 is of ideal size for a 15-inch laptop. The 360-degree rotation makes it a two-in-one laptop/tablet combo. HP Spectre x360 offers long lasting battery timing of more than 12 hours. Point of Concern: HP Spectre x360 can heat up when used intensively for a long time. However, it will never cross the standard temperature threshold. 2- Lenovo Yoga 910 – Speedy, Smooth & A Flexible 4K Laptop! Lenovo Yoga 910 is the 14 inch 4K laptop that promises crisp display screen. The laptop is really thin and light which makes it easy to carry around. 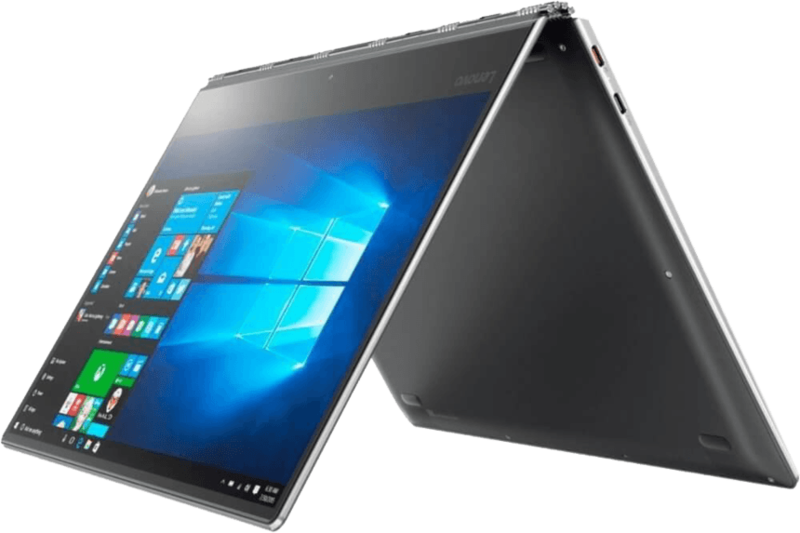 Lenovo Yoga 910 also performs twin function of a laptop and tablet due to its 360 degrees flexibility. The battery time can exceed a maximum of 9 hours, which is just enough. Overall, Lenovo Yoga 910 is a decent 4K laptop option. Point of Concern: the 14-inch screen display is borderline enough for 4K resolution. We won’t mind a couple of inches more in the screen size. Dell Inspiron is not the best-looking laptop out there but it definitely has the best processors that enable outclass performance. Dell Inspiron cannot be rotated 360 degrees but it has a touchscreen with 4K resolution. The machine is built to do the heavy and intensive tasks so gamers and professionals will love it. The decent battery time of almost 10 plus hours is also a delight. Point of Concern: The laptop weighs almost 6 pounds which means it is too heavy to carry in your bag. Razer Blade Pro is a beast when it comes to 4K gaming laptops. The specifications of this one will make any gamer drool. Of course, that’s reflected in the price tag too. Razer Blade Pro is like a dream comes true with the premium packed components. It is ultra-thin and light for a 17+ inch 4K laptop. Point of Concern: Razer Blade Pro is very expensive. You will be paying a lot to get this 4K beauty in your home. 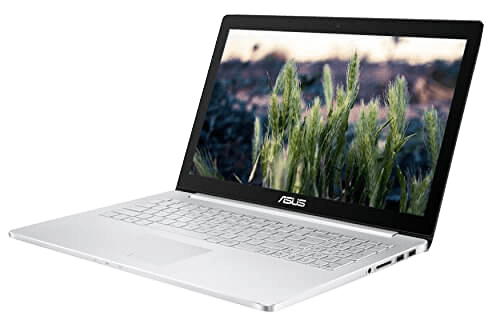 5- ASUS Zenbook Pro – A Power House Of A 4K Laptop! ASUS Zenbook Pro has impressed us with its features and performance. It is the laptop for multitasking. ASUS Zenbook Pro is a slim and sleek machine that can handle all your work while boosting a 4K display. The cost of owning this one is a tad bit higher. However, ASUS Zenbook Pro has a 7th generation Intel quad-core processor with 16 GB RAM. Point of Concern: ASUS Zenbook Pro only offers 6 hours of battery time which is far too less than any other laptop featured here. 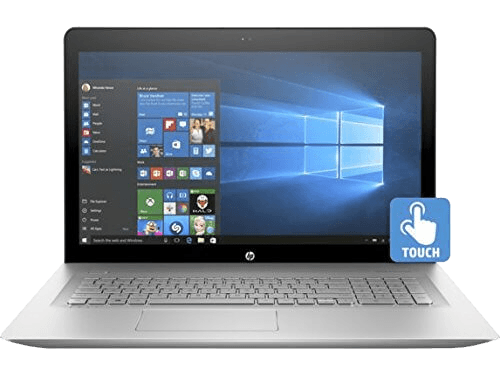 HP Envy 17t is our second laptop from HP. The manufacturer is known to launch finest machines. HP Envy is also an example of beauty meeting the brains. The silver plus aluminium body with the strong specifications is a killer combination. For a 17.3 inch 4K laptop, HP Envy 17t is really light with the weight of only 6.6 pounds. Point of Concern: We are not too happy with its 4K display. Since the screen is 17.3 inches, it was supposed to light up the screen but the spark is missing. Wait! What Is 4K Laptop And How Is It Different From Standard Laptops? So far, it is understood that 4K resolution is there to produce the finest display on any screen. It has been adopted in TVs, cameras, movie projectors and very recently, in laptops. The basic difference between regular laptops and 4K laptops is that of the display. Regular laptops mostly have 480p SD, 720p HD or 1080p full HD resolution whereas 4K laptops come with full-fledged 4k ultra HD resolution of 3840 x 2160 pixels. The change in resolution impacts the overall packaging of the laptop. 4k laptops have to have the heavy duty processors and GPU specification in order to handle 4k resolution on 15 to 16 inches of laptop’s screen. The limited screen size of a laptop makes it difficult for 4K resolution to existing without extra effort. In spite of the obvious disadvantage, 4K laptops are thriving in the market. There are many brands with flagship 4K laptops including Asus, Toshiba, Lenovo, Dell, Apple, and Acer etc. What Do I Need To Make 4K Laptop Work? 4K laptops are the off-the-shelf product. Basically, you don’t need to plug in any extra equipment for using a 4K laptop. You simply have to buy it and put it to work. 4K laptops are pre-packaged by the manufacturers. They are already using the most appropriate and compatible components like processor, RAM, GPU etc. So there isn’t much you can do to make 4K laptop work. However, the case is entirely different for 4K desktops. You have to select other specifications with utmost care in order to enjoy the finesse of 4K resolution. One wrong selection and you will be in trouble. The advantage of 4K PCs over 4K laptops is the customization. Desktops are much more customizable, hence powerful, than laptops. Best 4K Gaming Laptops: How 4K Laptops Are Good For Gaming? If you have got the best laptop, gaming is mind blowing with 4K laptops. However, don’t miss the point of having “the” best 4K laptop. Otherwise, you will pull out your hairs in frustration. 4K laptops will only provide the display results with top-notch supporting components. We have monitored a ton of forums and user reviews to assess the relationship between gaming and 4K laptops. Honestly, the gamers are not happy with 4K laptops. Most of them are complaining about the battery issues and lagging. Again, everything depends on the other components of 4K laptops – whether they are ready to bear the extra load of 4K resolution or not. So it is very important to buy a 4K laptop after an in-depth analysis of each and every specification. Better yet, you can select one from our list. In order to enjoy the real charisma and charm of a 4K laptop, your screen size must be higher in number. 4K resolution in smaller screen is almost similar to an HD screen. There is no point in wasting so much money if you are buying a small screen laptop. 4K laptops show the best result in 15-inch plus screens only. So don’t commit the crime of purchasing a 13-inch screen 4K laptop. The problem with 4K laptops is that there are still many software and games that are not compatible with it. So a 4K laptop will not adjust the non-compatible programs onto the screen properly. However, the case is not similar to simple HD screen display; it can adjust as per the demand of the program. Internet connectivity is another major issue. You will be downloading 4K videos to watch on your 4K resolution laptop. This will require something extra from your internet connection. You will require internet connectivity of 18 to 25 Mbps for smooth function. You cannot argue what well-designed 4K laptops do for gaming. You will be able to see each and every detail on the screen. The games will feel more alive to you. With 4K laptops, you are simply increasing your level of gaming satisfaction. You will not be playing the game from behind the screen anymore but actually from inside the screen. We know this is hard to understand but you will get the phenomenon once you play the game on a 4K laptop. One thing that we can’t get over with 4K laptops is just the clarity of the screen. It is so smooth, vivid and alive that even mundane tasks seem fascinating. The 24/7 experience of crystal clear screen is something that makes you pat your back for spending those extra bucks on a 4K laptop. Again, you will get it once you use a 4K laptop every single day. 4K laptops are ideal for professional graphic design work because designers are truly the people who can find 250+ pixels per inch of 4K resolution extremely useful. 4K laptops won’t give you that level of satisfaction for any other purpose like video streaming. A 4K laptop is ideal for visual artists and graphic designers. Nothing gives you bragging rights like 4K laptops. You can show it to your friends and the screen will speak the rest. The 4K laptop will definitely become one of those possessions that’s envied by people around you. You will be attracting admiration for owning a laptop with crystal clear screen. Just for this reason alone, 4K laptops are worth it. Now You Know The Best 4K Laptops For Gaming And Editing – It’s Worth It! 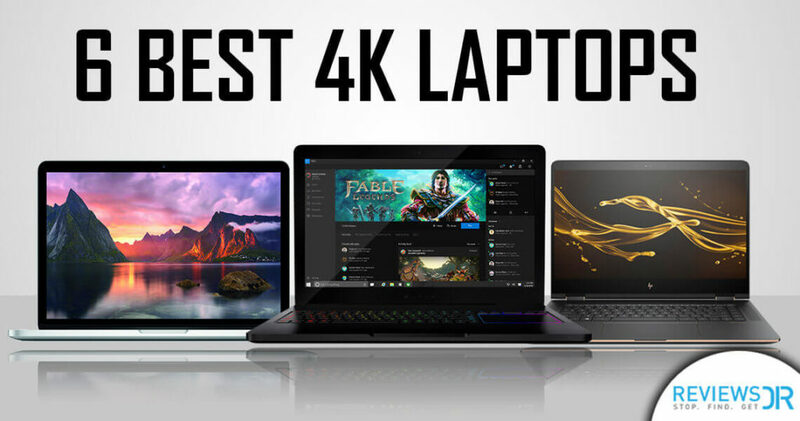 We have achieved our purpose of telling you about the best 4K laptops for gaming and editing. We would like to remind you that we keep updating our lists regularly because of the ever-changing world of IT. Being part of the IT industry has enabled us to assess and forecast the future circumstances based on the knowledge and information known to us currently. In short, you can trust ReviewsDir list of the best 4K laptops for gaming and editing. Which 4K laptop are you using now? Do you have any other name to add to our list of the best 4K laptops for gaming and editing? Please write away, we are looking forward to your response.